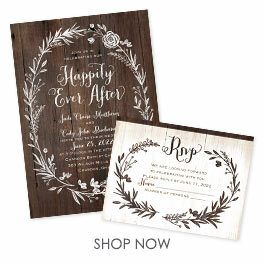 Let your love for vintage style become the focal point of your wedding invitations. An intricate lace pattern accompanies "Mr and Mrs" in beautiful script font. "Kindly reply" appears in a matching script font on the response postcards. These two-sided wedding invitations are printed with your invitation wording on the front and your choice of wording on the back (reception and wedding website details shown). Response postcards are included and matching information cards are available. Size: 5 1/8" x 7 1/4", Response Card 5 1/8" x 3 7/8"
Personalization Options: Lace design and "Mr. and Mrs." are printed as shown in your choice of color. "Kindly Reply" is printed as shown in your choice of color. Your wording is printed in your choice of colors and fonts. I absolutely loved my invites. I was impressed when customer service called to verify the information on the Invite. Come to find out I had made some mistakes. The woman on the phone was very pleasant cared about my order. The invites are beautiful and it was cost effective!!!! I have never been so happy in my life! These cards are gorgeous and I have never had such a great checkout, purchase and delivery turnover this wonderful. After my suit rental place (Dunhill) lied about giving us free invitations and charging us upwards of ($500+) for invitations and rsvp cards, I was freaking out with 9 weeks to go until my wedding. I did not want to spend $500+ on paper so after days of researching I came up with this site. I was really nervous that this site was too good to be true but after ordering on Thursday morning and praying all day that everything would be okay; I got a knock on my door that Saturday afternoon to the delivery man. He gave me a package and I though "there is no way this is my cards after 3 days." I opened them and instantly began to cry. THEY ARE BEAUTIFUL!!! They even added the words I asked them to in the inscription at the top. THANK YOU SO MUCH!!!!!!!!! !